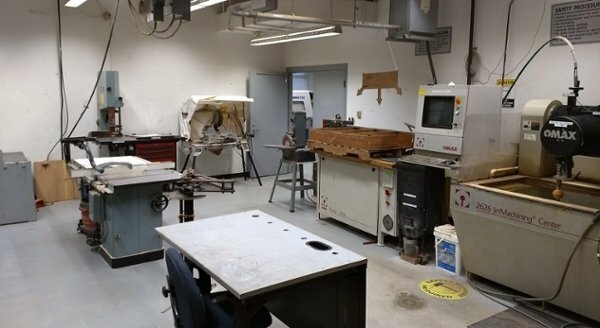 The Mechanical Engineering Shops are specially designed spaces to facilitate hands-on learning through class projects, engineering clinics, and research support. The facilities enable our students to implent the "Design. Build. Test." life cycle used in engineering projects. Shop operations are monitored by two technicians and a team of student lab assistants to maintain a safe, clean working environment. The Projects Lab is the "hub" of the Mechanical Engineering program. 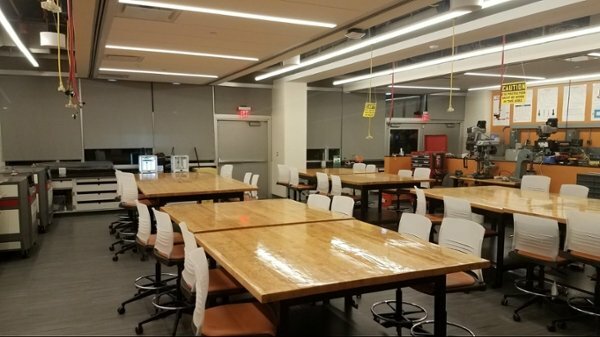 Half of the room has eight maple top project assembly tables while the other side of the room is home to the rapid-prototyping equipment. The Teaching Lab has four rows of lab benches located towareds the front of the room with air and vacuum hookups at the end of each bench. The rear of the room houses soldering stations and electronic diagnositics and testing equipment. The Model Shop contains essential woodworking equipment, basic metalworking equipment, and a CNC waterjet. The Model Shop also offers storage space for student projects. The small Welding Shop offers TIG, MIG, and stick welding capabilities. The Welding Shop also has a glass beading cabinet for weld preparation and a horizontal bandsaw for rough stock preparation. The Machine Shop houses a CNC mill and lathe as well as metrology equipment for part inspection.